This was the last week of She Shares Truth; and of course this is the week I am late to the game! However, I really wanted to make this goal! I promised myself I would participate each week! Guess what? Of course, this week (the LAST week) was SO busy! With Spring Break and the kids being home, I felt like I didn’t really have time to study and put in my best effort…..and of course here it is Saturday night at 11:15, raining cats and dogs, but I am gonna finish! 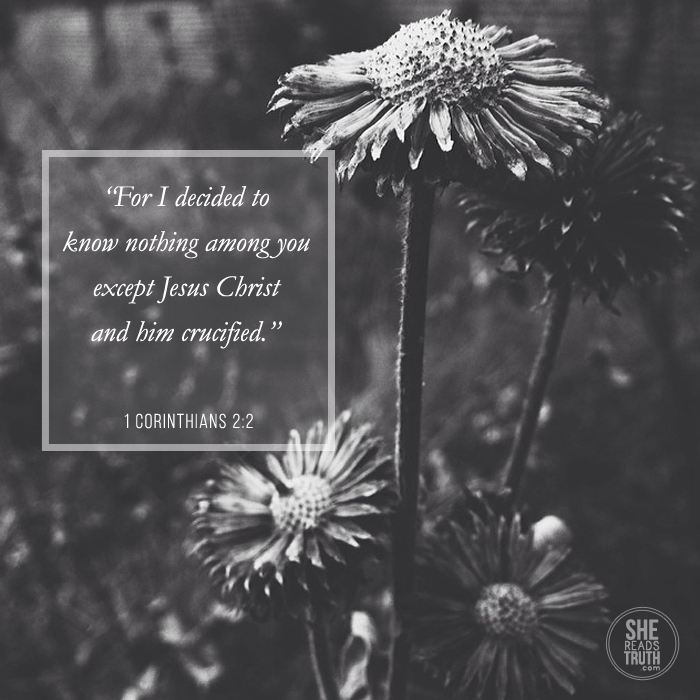 This weeks passage is I Corinthians 2:1-5 (you can read it here). In case you hadn’t noticed, I love The Message; I mean really, really, really, LOVE The Message! I don’t know about you guys but I have always been kinda intimidated by Paul. He was a Pharisee; which means he really knew his scripture! And after he came to know who Jesus REALLY was on that dusty road to Damascus, he could not be stopped! He spread the message of Christ everywhere! He was the one who told the EARLY church how to do CHURCH! So, to read a portion of scripture that starts out with Paul basically saying that he is at loss for words, or felt inadequate and was scared to death (according to The Message) to share Jesus with the church at Corinth surprises me! This IS Paul we are talking about, remember! But the message came through anyway….. The words Christ is enough keeps going through my head and my heart (heads up, I am probably going to write about it a few times). I ended my post last week with those words and cannot stop thinking about them. Even as I read this passage, what stands out to me the most is that Paul couldn’t do it on his own. He didn’t have the words to impress them, he didn’t have the wisdom he felt he needed to convey the message. He wasn’t qualified in his own mind to bring them the good news. But, you know what Christ was enough! The story was enough! Christ crucified; what He did for you and me is always ENOUGH! Do you have any areas in your life right now that you are looking at dumbfounded? Not able to find the words to speak into the situation to make it bearable? Are there times when you are just flat out scared to death about something you have to face in this life? I can say yes to all of those questions….. I want to encourage you today that Jesus is enough! Christ and Christ crucified is enough! He is enough in any every situation we face. 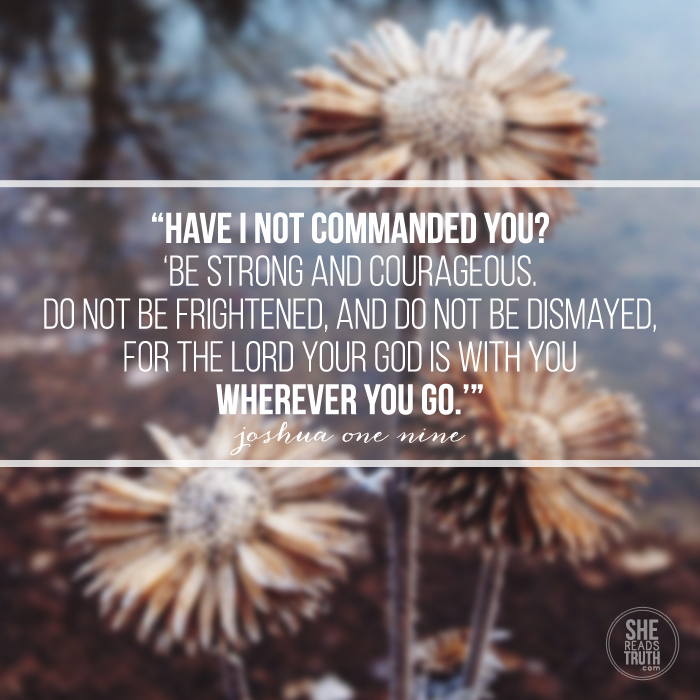 He is enough when we are discouraged. He is enough when we are scared. He is enough when we are sick, and when we are poor, and when we are at the end of our rope. On our own we cannot change a thing! But Jesus, HE is ENOUGH! It’s Spring Break! I have been so excited for this day for the past two weeks; not because we are going anywhere, but because I really do like having the kids at home! Oh, and not having a 6:3oam alarm for the next week is pretty nice too! My kids are finally past that stage where they wake up before the break of dawn everyday (Thank you Jesus), so I am looking forward to a nice week at home….with a little extra sleep! It’s Friday, so that means I get to write for She Shares Truth! I have really loved digging into the scripture this way and reading what everyone else is learning too! I have been so encouraged through this She Reads Truth challenge. I am little bummed there is only one more week! The passage of scripture this week was Joshua 1:8-9; you can read it by clicking here. Moses has just died and Joshua has just been given the task of leading the Isrealites into the promised land. The place they had been trying to get to for the past 40 years! Joshua has to fill the shoes of Moses; the man who God called friend! Talk about overwhelming! However, even before Joshua has a chance to express his fear, before he even has the chance to get overwhelmed, the Lord is already speaking encouragement into his life! God knew Joshua! The Lord knew exactly what Joshua needed. God’s goodness cannot be measured. It’s his stability in unsure times that keeps us. Meditating on His word brings calm. He instructs Joshua to meditate on his word day and night. He tells Joshua that when he does this he will have peace and success no matter the opposition he may face; even from among his own people. He promises to be with him wherever he goes, whatever he does, and however long it takes to get there. This promise applies to us too! How encouraging is that?! The Lord knows us in the same way He knew Joshua. We only need to meditate on His word. His Word is always enough. The sun is out and I can see some of the grass in my yard that has been covered since early November!!! It’s a good Friday! Today is also She Shares Truth Friday! So I am devoting my post today to Psalm 38. I have to tell you this one was difficult for me; it’s a really heavy Psalm! Especially for a girl who is trying to write about joy! You can read Psalm 38 here. Many Bible scholars feel it was written by David right after his “situation” with Uriah (you know the one where he arranged a murder to cover up an affair). What resonates with me the most is the heavy and overpowering sense of guilt that David is facing. This guilt has made him sick, angry, and isolated. He is completely distracted by his sin. His guilt has taken him really low. But even in the deepest pit he still called out to God for help. Psalm 38 is full of David’s longing to restore his relationship with the Lord. I think you see the full spectrum of his emotions. He feels abandoned by God and mistreated by his friends. Ultimately, he realizes that he is the one to blame and lays it all out before the Lord. He confesses his sin and says he will wait as long as it takes to restore the relationship. David has always been one of my favorites in the Bible. He was a man after God’s own heart, but we still see him struggle with sin. When I look at David I see someone who is gut-honest with God! When you read his Psalms you can see him at his highest and at his lowest. He sings his God’s praises. He proclaims God’s righteousness and the wonders of His creation. But he also cries out in desperation for God’s attention, and writes about feeling forsaken by the One he loves. He begs to feel close to Him again. Much like David, in Psalm 38, I find myself getting so distracted by my own version of things. I get distracted by my own sin. My own grief and unanswered prayers steal my focus. In an honest moment I would have to say that there have been times I have turned completely away from Him because of distraction and blame. If God would have just come through in the way I thought was best everything would be perfect; right? And I feel far away. And God seems distant. And I feel low. But God never leaves. He never gets distracted from His love for me. He never tires of forgiving me and helping me find the right direction. He is as close as the mention of His name; all we have to do is call. And that is what David does in this psalm. Even though he feels low and far away, he still calls out to the One he knows will save him. That is where we can find joy in this very heavy writing. Even though David felt he was far from the Lord and was distracted by his sin, there was still forgiveness waiting for him. Lent is about coming back to Christ. Lent is about giving up distractions and turning our focus to the One who saves us. David came back to the Lord and he was saved from his sin. God waited for David, just like He waits for us to turn back to him. Let’s find joy in the One who never leaves us and waits for us even when we are distracted.